Considering that Red Bull wasn’t introduced in the U.S. until 1997, there’s only one thing that can make a guy freak out like that, and it’s not Mountain Dew. 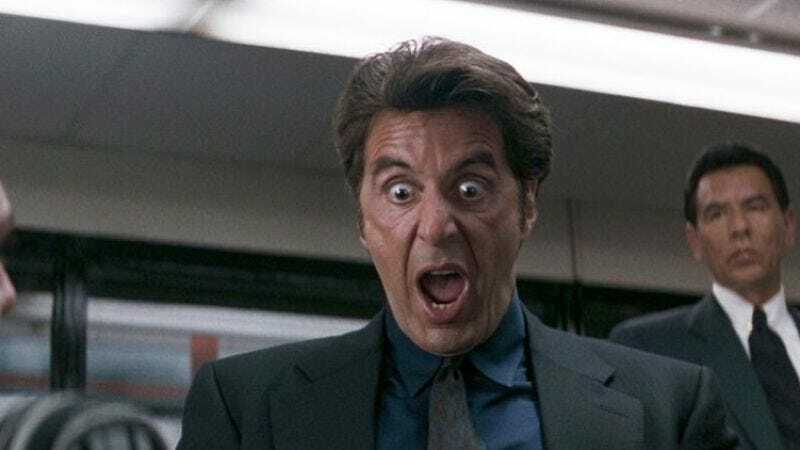 But, for some reason, Pacino has always remained elusive when discussing his character’s motivations in the film, and whether or not good old Vincent was making some unauthorized trips to the evidence room from time to time. Until last night, anyway, when Pacino explained that the character is supposed to be strung out on cocaine throughout the film at a special Academy screening of Heat in L.A.
“I don’t think I’ve ever said it out loud,” Pacino said, explaining with words what his actions had already clearly stated. “But I’ve always wanted to say it, just so you know where some of the behavior comes from.” Next thing you know, he’ll be telling us that Tony Montana was a coke head, too.